I just got back from New York where I was attending Virtual Worlds 2008 and the concurrent Virtual Law Conference 2008. I was a bit too involved with the law conference to get to really experience the rest of it, but people tell me it was great. 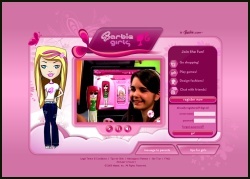 The two big stories from the conference are that Barbie Girls is going to start offering some content by subscription, and that IBM is putting some of its Second Life servers behind its own firewall. The Barbie Girls VIP subscription model doesn’t have much to do with law, but it’s interesting from the standpoint of the future of monetization of virtual worlds for kids. I hadn’t seen a lot of the toy/game companies at the last one of these, but they were out in force this time. Made for a fun show floor and created some really odd moments, such as being introduced to “Rosie O’Neill, our chief Barbie Girl” at a speaker reception the first night. Rosie’s not a booth babe who stands around handing out branded pens, she’s a Mattel executive who has a lot to say about the future of Barbie Girls, and she gave half of the keynote — but I’m a guy who grew up in a family that viewed Barbie as a plot to brainwash little girls into believing that lipstick was more important than logarithms, so Rosie’s title made me nearly drop my beer. Looking at the product though, I love the idea of a virtual world for girls, if for no other reason that that it gets girls involved in computing at an early age. Along the monetization lines, this conference marked the first public appearance for a lot of startups that are moving out of stealth mode. The vast majority of these are kids worlds, but I talked to a significant number of people who are working on business-oriented virtual worlds too. What didn’t I see though? Anything that looks like a direct competitor to Second Life. Post in the comments if I missed it and you know of something, but I didn’t hear anybody even talking about offering the combination of a) unfettered content creation, b) user-retained ownership of intellectual property rights, and c) a real market for in-world currency. I half-expected to see a big pavilion for somebody I’d never heard of (or Google Earth 5.0) in the middle of this exhibit floor giving out the best tchotkes and making the Linden Lab people a little nervous, but I didn’t. My guess is we will pretty soon — maybe at the next one of these in LA this fall. Regarding IBM, my understanding is essentially that they are going to start running some of the IBM islands behind an IBM firewall, largely private from Linden Lab. It is not clear to me whether the actual servers will share space in the Linden Lab farm, or will be geographically separated and totally under IBM control. I got different answers from different IBM representatives there, so I think that it is probably still up in the air. Either way, this gives far them greater control over data retention and security, and it is a big move that, in my mind, signals the future of this space. Notably, this model is the only way that I’d recommend “practicing law in a virtual world” (which I don’t, right now, though they are fantastic places to network, meet potential clients, have educational and training sessions, and even exchange non-confidential data). If a law firm can get its own firewalled server and Linden Lab doesn’t have access to the chat logs, though, I will be be infinitely more comfortable interacting with clients in the space. Same is true for business — private servers mean that conversations about trade secrets are possible. Whether via Second Life, somebody else, or, I think most likely, via the emergence of a set of standards (the web/HTML model) individual hosting of portions of a larger virtual space seems inevitable to me, and from the standpoint of business and law, absolutely necessary. Steve Mortinger, IBM’s VP & Associate General Counsel of the Systems and Technology Group, keynoted the Virtual Law Conference, and he noted that one of the bigger problems for IBM (and other high tech companies using virtual worlds for meetings) is one I’d not thought of: export restrictions. You can’t practically discuss or show a model of a chip that handles encryption (as just one of dozens of examples) in a virtual world right now because you do not know where the traffic goes, or who might have access to logs from countries under export restrictions. Steve also pointed out that IBM’s new model is at least a step toward alleviating a number of other concerns that came up over and over in the legal sessions: confidentiality, security, and parter identity. I spent most of my time in New York dealing with the Virtual Law Conference track — moderating panels, speaking, and helping keep things moving. I was really pleased at the turnout for a lot of the panels and presentations, and want to thank the organizers for putting this together. The number one request, by far, was that we offer CLE (continuing legal education) credit next time, and I agree that we need to make that a priority. We haven’t even started talking about the next one of these yet, but if I am advising again, I will definitely push for it. Thanks to everyone who participated in the conference: organizers, speakers, and most of all, the attendees. Along those lines, I am speaking in Dallas in a couple of days at the Spring Meeting of the ABA’s Business Law Section as part of a panel on legal issues in virtual worlds and games. Shoot me a note if you plan to be there. Sounds like a great conference. Any Asian developers make an appearance? @1 – Yeah, but I was so tied into the law thing that I’m the wrong guy to ask about the general conference. I know GoPets (developer is in Seoul) had a representative on one of the legal panels, and I’m sure there were others. all that happened is Linden labs got a DIRECT customer, and Mattel, who’s last foray into New Media led to the Barad “Knowledge Adventurer” buyout “problem”. :)… made a flash site for BARBIE. The biggest RCE (Real Cash Economy) news I saw come out of the conference was VastPark’s partnership with Twofish. See my post on our homepage for more detailed info, but, I think these guys are the competition for Second Life you were looking for. I would love to hear your take on the overall ramifications of Twofish Elements if it becomes the norm for RCE business models. Personally, it almost feels like the avatar portability solution in a weird way. Readers will definitely want to check it out. Vastpark also appears to have solved some major concurrency problems that SL has with the NICTA partnership. Multiverse would help the metaverse become more mainstream as they had a 3D and a 2.5D viewer that could render the same virtual space. It was very interesting to see two screens showing the different perspectives at the same time. Honestly, the Second Life competitor has already been out in the open for a while. OpenSim and RealXtend (who were at the Open Source VW Roundtable) are advancing extremely fast and are already available to anyone. They are missing your “a real market for in-world currency” point, but since they are open, anyone implementing a world could plug in one of several VW payment solutions offered at the conference. There may not be a hosted competitor, but from a platform standpoint, I think it is likely the Apache of VW. I’ve been meaning to get set up in Openlife for a bit, and this, along with a conversation I had at the show, convinces me. I’m downloading the various parts now. Look for some coverage regarding Openlife and legal issues in the near future. One interesting legal point you might take a shot at covering is what I hear about on Central Grid. Some of what I’ve read makes it sound like most of the people who left SL due to something getting banned (e.g. gambling) took their business to the Central Grid (which is an OpenSim grid). I’m sure there are plenty more issues available on the many OpenSim grids that are out there since they are not all run by a single group so I’m sure they are extremely diverse in how the owners run them.